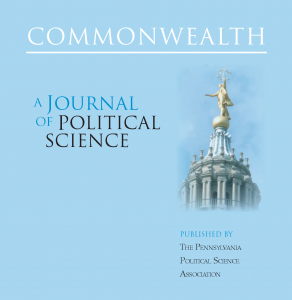 Beginning in 2015, COMMONWEALTH: A Journal of Political Science has transitioned from general political science research to a new concentration on Pennsylvania politics and policy and regional issues affecting the Commonwealth. The Pennsylvania Political Science Association (PPSA), the Pennsylvania Policy Forum (PPF), and Temple University’s Institute for Public Affairs (IPA) are cooperating to produce the new publication COMMONWEALTH: A Journal of Pennsylvania Politics & Policy. COMMONWEALTH: A Journal of Pennsylvania Politics and Policy is the peer-reviewed journal of the Pennsylvania Political Science Association published online by Temple University Press. COMMONWEALTH is published three times annually. A special issue devoted to a single area of Pennsylvania public policy is published in January to coincide with the beginning of the state’s legislative session. The remaining two issues of the journal are published in the late spring and early fall. These two general-topic issues are composed of traditional research-based articles, expert political analysis of current policy dilemmas in the state, essays, and book reviews. We are seeking manuscripts across a broad range of topics related to the politics, policy, and political history of Pennsylvania. The journal is interdisciplinary in nature, appealing to scholars and practitioners in fields such as political science, public administration, public policy, and history. COMMONWEALTH’s editorial staff, Editorial Review Board, and referees maintain the highest standards of peer review and publication. COMMONWEALTH is a peer-reviewed journal founded by the Pennsylvania Political Science Association in 1987. From 2004-2010, the now defunct Legislative Office for Research Liaison (LORL) of the Pennsylvania House of Representatives jointly published the journal with PPSA. Copies of COMMONWEALTH are sent to all PPSA members – individual, departmental, and institutional.